Blog How Do You Know When It's Time to Let Your Pet Go? We all want to be our pet’s hero and sometimes that means knowing when to let them go but how do you let go of something that has such tremendous meaning? This road is the bumpiest, roughest and most gut-wrenching I have ever been down. The loss of my pets has hurt more, and still hurts more than losing some of my close relatives. I know that might be hard to hear for some, but for others, I know you are nodding in agreement. I’m not saying I loved my dog more than my grandmother – I’m saying that their loss took a greater emotional toll. My dog, Tank, was a constant companion. In our 11 years together, I would guess we’d been apart less than 30 days; we went everywhere together. He knew all of my secrets, and the very best part was that he never judged me. We live in a world where no matter how many great people we share our lives with, at one time or another, they have judged us, wronged us, or made us feel bad. Our pets don’t do that. They may ruin our favorite shoes or chew the sticky note with an important phone number you needed, but they never hurt us – they truly loved us unconditionally. Every pet has a meaning, I call them ‘chapters of our lives’ that complete our book of life. Tank was my foundation chapter, upon his existence so much has stemmed. Because of Tank I changed careers, met my husband, built a pet care business, started breeding, showing and doing performance sports with my current dogs. It’s also because of him that I started my passion for pet first aid & CPR and am here, typing this blog right now because that little Boxer came into my life. His meaning is tremendous as was his loss but he’s the one pet, despite his deep-seeded purpose in my life, that I do not regret when I let him go, the others I do. As I have mentioned in my previous blog about how pet loss effects children, putting a pet down via euthanasia is a gift we get to bestow upon our pet. A gift of good death – literally what euthanasia means in Greek. We’re not as fortunate with humans in contrast, my grandmother did not have a good death; I wish we could have given that to her. Since pets can’t talk, how do I know when to do it? What if they could get better? Have I let them go too long? How will I tell my children? What will my life be without them? The list goes on. Some of these can’t be answered. You just have to trust your veterinarian, your friends, and your family. I can say my first dog to be put down, Dozer, I let go too long. As for Tank, my first dog but second to say goodbye to – some would say I let go too soon. It was mine and my husband’s decision, as only those closest can make the decision they feel is best. My Tank didn’t judge me or look into my eyes and tell me I let him go too soon. He looked into my eyes and saw sadness; he saw an owner who could no longer make him happy because his disease had ravaged his body. It was unfair of me to keep him alive. It took everything in me to let that dog go, and I mean EVERYTHING. Your animal means the world to you and my Tank was no exception to me. He was a part of every aspect of my life. As difficult as it was to let him go, it would have been cruel for me to perpetuate his life.There are many questions that arise when a pet’s end nears. Does your pet still enjoy life? Can your pet function day to day with dignity? Is your pet in unmanageable pain? Does your pet enjoy the things they always have? So while we carry the burden of making that dreaded decision, we should take solace in the fact that we are giving a gift to our best friends, who have given their hearts to us. If you have ever heard of the story, “A dog’s purpose according to a 6-year old”, you will have an amazing insight from a young mind as to why our pets’ lives are so short. As a professional pet care provider and passionate pet first aid & CPR provider, I have been exposed to far more deaths of peoples’ pets than I feel my heart can endure. 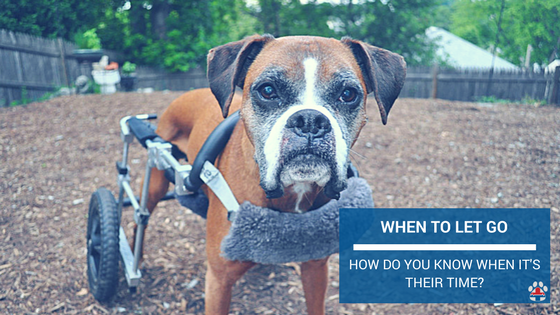 There is a compounded issue when you care for pets. You not only love the animals that you spend your days with, but you get to know the people that love these pets too. Every time a pet-client passes, my heart aches twice; first, for the loss of that pet in my everyday life and second, for the loss of that pet in their owner’s lives. It’s awful, but each time I try to look ahead to the new chapters as a coping mechanism. Our relationship with each animal is unique, and we’re lucky to have so many future furry chapters to look forward to. If you are contemplating “that time” for your beloved pet, or know someone that is, there are some great resources out there to help us help them. 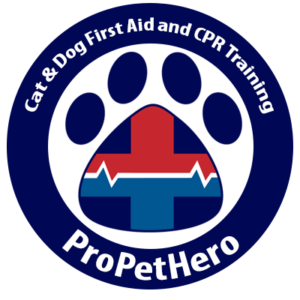 First, included in the ProPetHero pet first aid & CPR course is a wonderful module from our ER vet on our pet’s end of life. Veterinarians are your best resource to help make an informed decision for your pet as well as provide resources to help you through mourning. Then take a few minutes to read about other peoples’ experiences. Although your situation is unique, there are many animal lovers who share the same concerns and may help you to find comfort and guidance. I am always here, feel free to reach out anytime. A great blog post by Kelsey Carpenter, a veterinary technician regarding things she wish we knew before putting down our pets. Be their hero, be strong, and be able to let them go. Give them a gift by taking all of your love and wrap their soul with it as you say goodbye. Cara, that was the most beautiful article that I have ever read. Thank you so much. Thank you for the words. My dog is 12 years old and she is already beginning to present many difficulties because of the ideade. This moment is difficult. We never prepared for it, we never thought about it before. I fit in exactly one of the questions you put: how will my life be without it? Sad. But your article made me think in a different way! Zippy has DM…each day is precious.. I enjoyed your article very much. I had to put my beloved Scotty down 12/26/17. It was honestly the hardest thing I have ,ever had to do. He was 16 years old and I had him since he was 4 months old. I also went out and found a new boy. I need that love and trust that he gives. The hardest time when dog leaves. we can greet new dog in or house but each one have separate space in heart.